Department of Chemical Engineering organized two day National Level Technical Symposium, CHEMFEST 2K18, on 20th March and 21st March, 2018. The event promoted the theme of “energy power innovation”. The Symposium contains various Technical competitions like Paper Presentation, Model Making, Poster Painting, Salt Act and Non Technical Competitions like Neon Cricket, friends Quiz, chase the mystery, mad adds. The Symposium was inaugurated by our Chief guest Dr. V. G. Pangarkar, Retd. Professor & Head, ICT, Matunga Mumbai, Honorable Principle Dr. K. N. Nandurkar and Mr. Chandrakant Mohikar (Petro-project Consultant), Prof. Jaideep Shah, Prof. Saurabh Ambiwadekar, Prof. M. Y. Khalkar were among the panel of judges for various events. Head of Chemical Engineering Department Dr. V.S. Mane promoted welcome speech for the event. The vote of thanks for Inaugural Function was proposed by Prof. P.P Joshi, ACES Co-coordinator. The total registrations for various events in CHEMFEST2K18were around 600. Valedictory function were held on 21st March, 2018. Chief Guest of the Valedictory function Mr. B. Sitharaman, Director, BSR Technologies Ltd., Nashik, Mr. Rohan Pawar, RAP Analytical Research & Training Center, Nashik Mr. Rushikesh Bhandari, Purchase House, Ambad, Nashik distributed prizes to all the winners. Prof. P. P. Joshi, Chemfest 2K18 Coordinator delivered vote of thanks for the event. Department of Chemical Engineering organized a One day National Level Technical Symposium, CHEMFEST 2K17, on 20th March and 21st March, 2016. The Symposium contains various Technical competitions like Paper Presentation, Model Making, Poster Painting, Salt Act and Quiz Contest Non Technical Competitions like Neon Cricket, Quizzard, Beg-Borrow-Steal, Counter-Strike-1.6, Mini Militia. The event promoted the theme of “Go Green”. The Symposium was inaugurated at the hands of Chief guest Dr. V. G. Pangarkar, Retd. Professor & Head, ICT, Matunga and Honorable Principle Dr. K. N. Nandurkar. 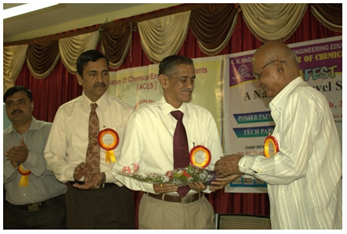 Mr.ChandrakantMohikar (Petro-project Consultant), Mr.AjitTambe, Graphite India Pvt. 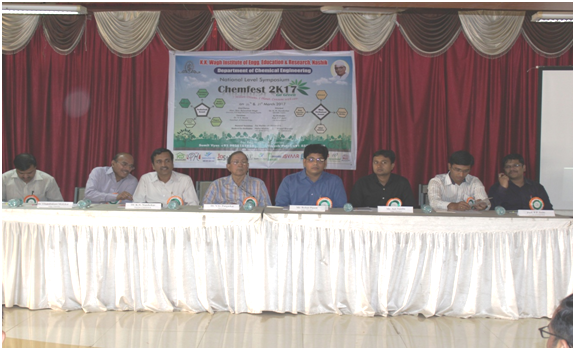 Ltd., Ambad , Nashik, Mr.RohanPawar, RAP Consultancy, Nashik and Mr.RushikeshBhandari, Purchase House, Ambad, Nashik were among the panel of judges for various events and Head of Chemical Engineering Department Dr. V.S. Mane promoted welcome speech for the event. The vote of thanks for Inaugural Function was proposed by Prof. D. H. Mahale, ACES Co-coordinator. Valedictory function was held on 21st March, 2017. Chief Guest of the Valedictory function Mr.KishorRathi, Director, Advanced Enzyme Technologies Ltd., Nashik, Mr. Ashok Deshpande, Director, Centre of Excellence, Upnagar, Nashik andMr.RushikeshBhandari, Purchase House, Ambad, Nashik distributed prizes to all the winners. Prof. P. P. Joshi, Chemfest 2K17 Coordinator delivered vote of thanks for the event. The total registrations for various events in CHEMFEST2K17were around 385. Department of Chemical Engineeringorganized a One day National Level Technical Symposium, CHEMFEST 2K16, on 16th March, 2016. The Symposium contains various competitions like Paper Presentation, Model Making, Poster Painting and Quiz Contest. The event promoted the theme of “Skill India”. The Symposium was inaugurated at the hands of Chief Guest Mr. B. Sitharaman, Director of BSR Technologies, Nashik and Honorable Principle Dr. K. N. Nandurkar. Mr.ChandrakantMohikar (Petro-project Consultant), Mr.AjitTambe&Mr.YogeshLawand from Graphite India Pvt. 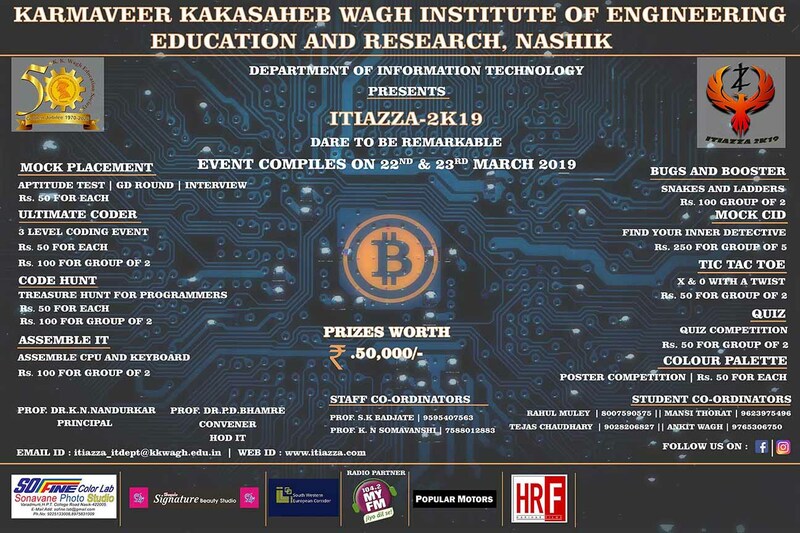 Ltd., Ambad , Nashik, Mr.RohanPawar, RAP Consultancy and Mr.RushikeshBhandari, Purchase House, Ambad, Nashikwere among the panel of judges for various events and Head of Chemical Engineering Department Dr. V.S. Mane promoted welcome speech for the event. Chief Guest of the Valedictory function Mr. Sameer Patwa, Director of SAM Consultech, Ambad, Nashikdistributedprizesto all the winners. Prof. S. S. Shinde, Chemfest 2K16 Coordinator delivered vote of thanks for the event. The total registrations for various events in CHEMFEST2K16 were around 300. Department of Chemical Engineering organized a two day National Level Technical Symposium, CHEMFEST 2K15, on 09th March and 10th March, 2015. The Symposium contains various competitions like Paper Presentation, Model Making, Poster Painting and Quiz Contest, Industrial Defined Problems and Advertisement. The event promoted the theme of “Engineering India”. The Symposium was inaugurated at the hands of Chief guest Dr. V.G. Pangarkar, Ex-Professor of ICT, Mumbai and honorable Principle Dr. K. N. Nandurkar. Mr.ChandrakantMohikar (Petro-project Consultant), Mr.AjitTambe&Mr.YogeshLawand from Graphite India Pvt. Ltd., Ambad , Nashik, Mr.RohanPawar, RAP Consultancy and Mr.RushikeshBhandari, Purchase House, Ambad, Nashik were among the panel of judges for various events and Head of Chemical Engineering Department Dr. V.S. Mane promoted welcome speech for the event. Chief Guest of the Valedictory function Mr. B.P. Sonar, Director of Abeline Polymers, Ambad, Nashikdistributed prizes to all the winners. 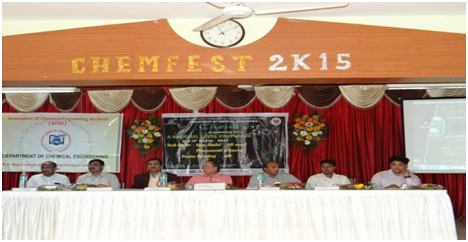 Prof. S. S. Shinde, Chemfest 2K15 Coordinator delivered vote of thanks for the event. The total registrations for various events in CHEMFEST 2K15 were around 600.